Ok, we are at Berlin Camp. This is effectively our summit push. It is the afternoon of the 8th , as you know we’ve been watching the weather carefully, watching weather report carefully, for a number of days now and we felt the 9th of January was going to the best summit day in this part of the month. A lot of other people apparently think the same thing, they’ve getting the same weather forecast or drawing the same conclusions. 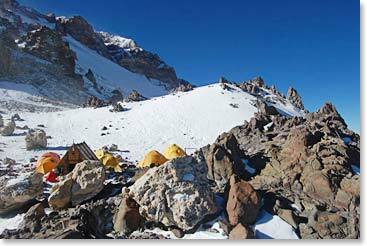 A lot of people moved up to the various high camps for their summit bids tomorrow. We are at the little A-frame shelters at Berlin Camp as I said at 19,550 ft. according to my GPS receiver. We set up a great little kitchen in one of those and we still got private tents that the Bolivian staff carried up one each for Neil, Dan and myself. 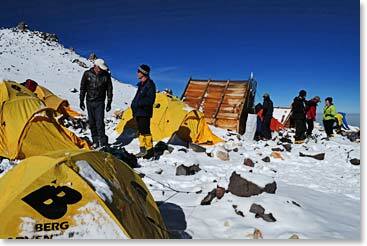 The A-frame shelter is great cooking and living spots for the Bolivians and numbers of the team. There are six of us up here all together, to climb directly tomorrow and to support, so we got the strength we need, and with regard to Neil and Dan the report is that they are doing very , very well. They are psyched, they are humbled, and they see what a big mountain it is, their spirits are high and I think they are in very good position to give it their all tomorrow. 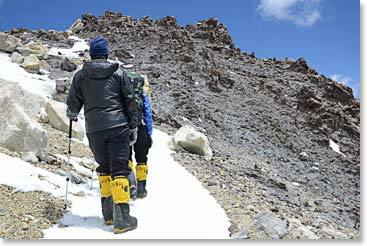 We will keep you posted as the summit attempt is underway; we are playing with our gear right now, getting our big double mountaineering boots fitted as well as we can, getting ready to settle down. We will wake up at 2:30 tomorrow morning and will be climbing by 4am. 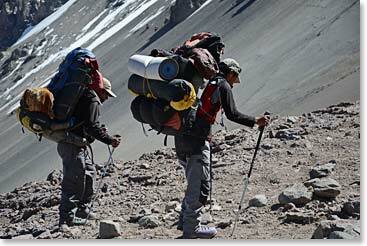 We will report to you about how it goes on Aconcagua summit day. Arriving at high camp, Berlin Camp, 19,550 ft.
Our super human staff, Osvaldo and Sergio, bringing loads and making sure we are comfortable and have all the support we need on the mountain.